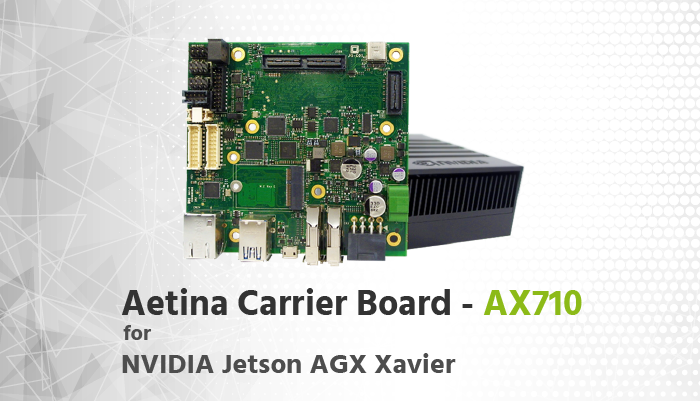 Taipei, Feb. 13, 2019/—For the upcoming trade show Embedded World 2019, an expert of edge AI computing solutions provider, Aetina Corporation will present their new carrier board AX710, which is exclusive design for Nvidia Jetson AGX Xavier. AX710 features its board to board connector support PCIe x8 like 10G Lan, which drives intelligent platform well in the speedy and data-based IoT environment nowadays. Jetson AGX Xavier is born to lead intelligent machines autonomously perform, and AX710 is the best one to liberate its entire power, brings a better, more thoroughly, and more variously applicate conditions for Xavier. Due to the high bandwidth, 10G Lan is the key that can reduce the latency and push the data matter in life. This new Xavier carrier, AX710 fully supports M.2 device and USB type C, which makes Xavier easier to integrate with other hardware, bring a high accommodation to work Xavier and reach to various intelligent application. In the era with cameras around, AX710 is flexible supported multi-camera like FHD camera x6, 4K camera x4, and GMSL/FPD-LINK cameras. This Xavier carrier can attach with up to four to eight cameras, making the application to be more abundant in different industries like surveillance in smart retail, inspection machines in smart factory, autonomous robot for medi-care, or monitors for intelligent logistics. Moreover, Aetina provides value-added service iNAVI for a smart quickly start. iNAVI optimization service built-in embedded OS based on Linux, including Secure Boot and System Recovery. Aetina pre-integrated the necessary driver porting and request OS specifications. Last but not least, serve a one-stop shopping experience is Aetina’s operating purpose for customers. Since it’s teamwork in AIoT world, Aetina brings various eco-partner together, they aim to integrate all not only hardware but also software, “We are working on making everything ready to all the customers. Therefore, they will not worry about how to drive a smart platform in their original solutions.” Said Joe Lo, the general manager of Aetina. Aetina is ready to co-work with all the partners from all kinds of industry, AX710 is one of the efforts they do for speeding up the smart idea flowing. To make an eco-cycle for the IoT is never an easy thing to do, but Aetina now do having some achievements and will show up in Embedded World 2019. Visit them on Feb. 26 to Feb. 28 in Hall 1, booth 1-259. Aetina founded in Taiwan in 2012, is a long-term support provider of high-performance GPGPU and Nvidia Jetson AI edge computing solutions for embedded applications, and since we are focusing on industrial market industrial components, longevity, and one-stop service are provided. Aetina helps our customers by offering a smart, innovated, and reliable solutions of GPU that approaching their needs in the meanwhile to solve the problems.